Home Headlines Capharnaum – The Tales of the Dragon Marked launches! Capharnaum – The Tales of the Dragon Marked launches! Today we’re delighted to announce the release of Capharnaum – The Tales of the Dragon-Marked, a brand new roleplaying game and a major new release from Mindjammer Press which launches today in PDF on Modiphius.net and DriveThruRPG.com, with the print preorder appearing on July 25th. Translated from the original French and edited and produced by ENnie-award winning writer Sarah Newton (Mindjammer, Legends of Anglerre, Achtung! Cthulhu, Monsters & Magic), this gorgeous 384-page full-colour PDF is the first in a series of releases for this exciting and action-packed game. 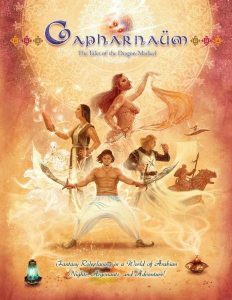 The PDF version of Capharnaum – The Tales of the Dragon-Marked is available immediately today from Modiphius.net and DriveThruRPG. The full-colour 384-page hardback will be available for preorder from 25th July.